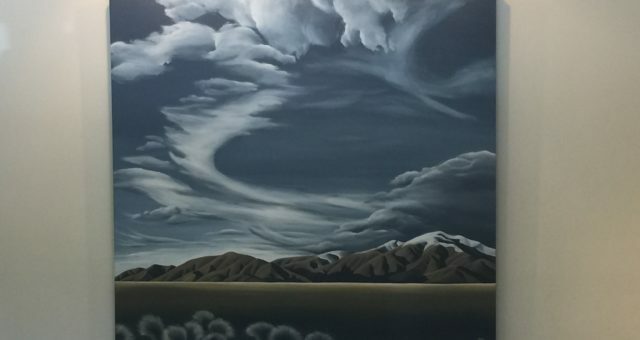 Many who stay at Tussock Peak comment at check-in, on the beautiful painting we have hanging on the back wall of the office. We were very lucky to have seen Diana Adams’s work early in her career at an exhibition in the Little River Art Gallery, I think it was around 2004, but all the works we liked were already sold. We were living in Denmark at the time so we put ourselves on her mailing list for when her next series was going to be sold. 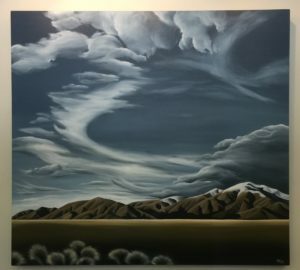 When that day came, in 2005, we got up in the middle of the night, viewed the works and bought the painting we now have hanging, “Southern Front”. We loved how the sky portrays the ever changing weather of New Zealand, dominating the rippling folds of the mountain chain, the grass lands in the foreground and the tussock blowing in the wind. At the time we bought it, we never would have guessed that one day it would be hanging in a motel with both “tussock” and “peak” in its name, and that we lived there. You can see more of Diana Adams works on her Facebook page, or by searching (many of her prints can be seen on the walls of Christchurch Public Hospital).